Savvy Spending: Free Krispy Kreme Cookie Classic Doughnut with App, today only! 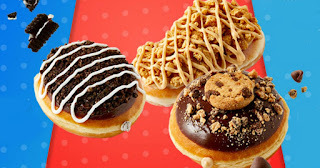 Free Krispy Kreme Cookie Classic Doughnut with App, today only! Today, 4/11, Krispy Kreme Rewards Members can receive a FREE Cookie Classic Doughnut! No purchase necessary, just show your Rewards Barcode found in the Krispy Kreme app or your email at the register.